Reasonably priced, this laptop weighs under 2.5lbs and is less than 0.8 inches thick. Chromebook comes connected to all the Google products needed for presentations and lets you load your documents to the Google cloud. Its fast boot technology gives your automatic updates and built-in security. It’s the perfect companion for traveling with your projector. With no set-up and 7 hours of battery life, the Samsung Chromebook can go anywhere you go. It’s built to stay cool, so it doesn’t need a fan and runs silently with no moving parts. 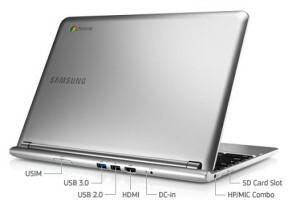 The new Samsung Chromebook is a pro at connecting up to your projector. For ease of use the HDMI Video out port, USB2 port, USB 3 port, and the power port are located at the back. This means no computer cables poking out at the side to get in your way during your presentation. Even if your projector is an older model without a HDMI connection, the Chromebook can handle the VGA/DVI cable converters. 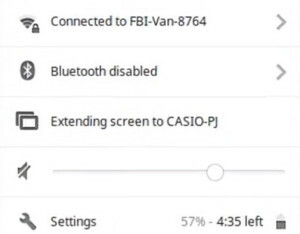 Check that your projector has as HDMI connection. If it doesn’t you’ll need a VGA to HDMI converter. Connect the HDMI cable to the back of your Chromebook and the other end into the projector. If you’re projector is not HDMI compatible, connect the VGA converter into the HDMI cable into the adaptor and then connect that into the projector. Turn on the projector and Chromebook. You’ll notice both the Chromebook screen changes and the projector will have the same screen shot. Option 1: Using the Chromebook menu, you can extend the screen, which turns the Chromebook desktop into a second monitor. This gives you the ability to drag screens onto the Chromebook desktop without displaying them on the main screen. In order to display them on the projector screen, you have to move them off the Chromebook monitor onto the projector monitor. This can get confusing. Option 2: The easiest way to control your screen image is with mirror image. Click Control and Mirror button (above the F5 key on the keyboard). 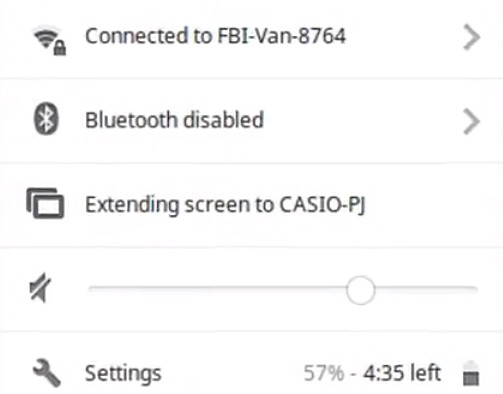 This displays whatever is on your Chromebook desktop onto the screen. Once you have chosen your screen option open your document and let the presentation begin! Need more help? Join our community of experts. Join our forum.